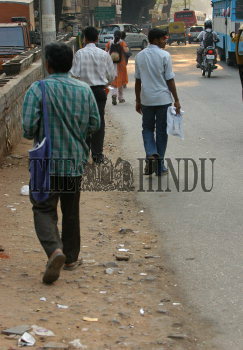 Caption : BANGALORE: Missing footpath: A few yards away from the Bruhat Bangalore Mahanagara Palike (BBMP) head office at Hudson Circle, people have to walk on the road braving a heavy traffic. This is close to Pallavi cinema, in Bangalore on February 27, 2007. Photo: K. Murali Kumar.